Time for a chocolate rush people! I've never officially reviewed Smuckers Fat Free Chocolate Syrup so it seems like I should do it when I have these free samples at my disposal --- There's some Caramel samples too, but I've already (cheesily) reviewed caramel before. 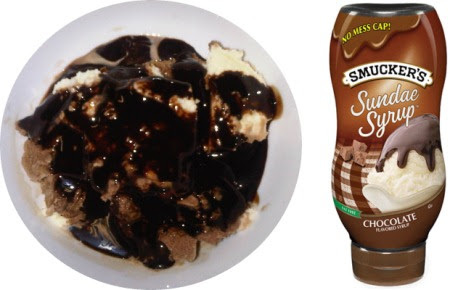 So I dumped way too much chocolate syrup onto of the worst ice cream ever made and decided to see how it tastes. I had a few straight little scoops of just syrup and it's pretty potent, but the thing is, I'm not sure I could really tell the difference between this and hersey's syrup if I was blindfolded. I had a few bites with the ice cream but this awful ice cream is driving me nuts. I decided to let it melt a little bit and stirred to the whole thing up into an overly chocolate milkshake (which I already kind of regret). Do I like it? Well, it's not that it's bad, but I think any true ice cream topping needs to stand up on it's own. I'm pretty sure if I were to take too many bites of this stuff, I would probably.... not feel well shall we say. It's not like you could drink this and be going "mmmm, it's like liquid chocolate", but technically I could count this as a postitive since it prevents me from downing one of these as my afternoon snack everyday. I know it's meant to accent whatever you are eating, that it's not meant to be had on it's own, so it's a fine typical topping, I just don't think it's anything special. At least it's super easy to pour! out of curiosity, what was the flavor of the ice cream that you had with the syrup? vanilla?